Made specifically for an exhibition at Boomalli Aboriginal Artists Co-operative in Sydney, Spirit clouds appeared on the organisation’s advertising poster and the exhibition invite. The triptych represents Michael Riley’s ongoing commitment to Boomalli as one if its founding members. 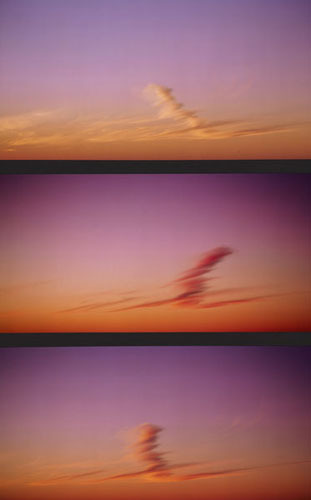 Spirit clouds, which depicts three sets of clouds in a sunset, calls to mind the trilogy formula and while the imagery is not overtly religious, as in other photographs by Riley, the composition of Spirit clouds has biblical overtones. It is one of Riley’s few stand-alone photographic works and calls to mind the artist’s recollections from childhood, particularly his stories of climbing up trees to photograph the sunset. The work is held in Monash Gallery of Art, City of Monash Collection in Victoria.